Finding out at ten years old that I was a relative of Civil War photographer Matthew Brady sparked my curiosity of photography. My Grandmother gave me a Kodak Instamatic and a roll of film and I went out to the park in front of her home in Lancaster County Pennsylvania to try and make some pictures. In the spirit of Matthew I found a large bronze statue of a soldier from one of the wars to be the subject for my first image. When the film was processed, I was thrilled to see some of the images actually came out. So there I was starting my love for photography not far from where many of the great battles were documented by my ancestor. Back at my home in Michigan when I was about twelve, my friend’s father helped us set up a dark room in his basement and taught us how to process film and make prints on an enlarger. I remember it being like magic when that first print appeared under the dim red glow. That was it, I was hooked! I was the yearbook and sports photographer for my Junior High, which allowed me access to film and the school darkroom. Soon I had my own darkroom at home, it was an oasis where I could experiment with different processes and ways of making images. My main inspiration was Ansel Adams, I read everything of his and studied every image he made. There was something about the tonality of his work that connected with me. I knew I wanted to be a landscape photographer like my hero Ansel. I was certain that I wanted to be a photographer. When faced with the fact that being a National Geographic Photographer or being the next Ansel was going to be about as easy as winning the lottery and knowing that most of the photographers I knew were making a living by shooting dogs, debutants and weddings, a path I was determined not to take, my photography stalled. As John Lennon said "Life is what happens when you're making other plans". I fell in love, got married had kids, learned to make money and provide for a growing family. It turned out I was pretty good at sales and built up a chain of retail stores, but somewhere deep inside was the soul of a photographer. Even when not photographing I still saw images and compositions everywhere I looked. I kept my Nikon around and took pictures once and a while, but wasn't devoting myself to it. After a serious motorcycle accident when I was about forty, I had a chance to reevaluate my life and the things that were really important to me. I decided that it was never too late to chase a dream. In 2001, now living in Florida, I discovered the beauty of the Everglades. Learning how to photograph them proved to be a challenge. I was inspired by the work of Clyde Butcher and was fortunate to become his friend and have opportunities to photograph with him. 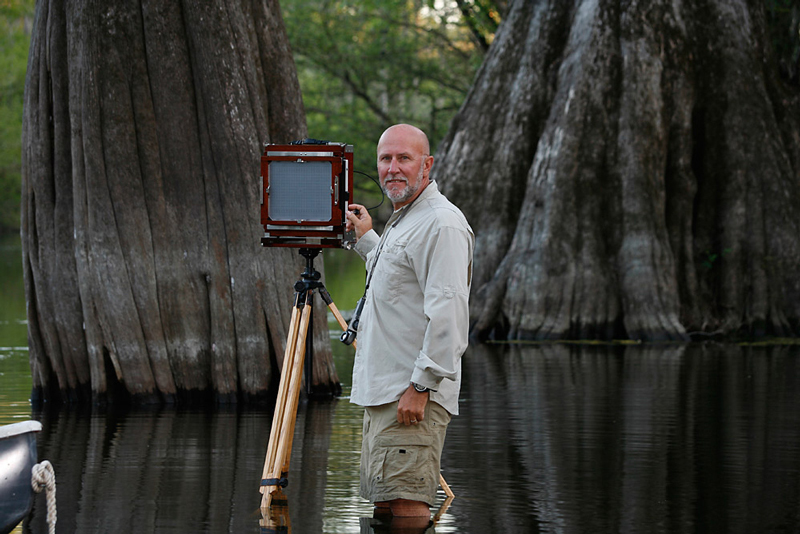 Much of my work is done with an 8x10 wooden view camera with black and white and color film. I process my own film and then scan it on a very high resolution film scanner, once digitized I am able to make all of the necessary adjustments such as burning and dodging, color correction, tonal adjustments and dust spotting, just as I had once done in the darkroom. The finished files are over one gig each and I am able to make finished prints as large as four foot by six foot with amazing detail. I print all of my limited edition prints with Epson HDR inks on cotton rag paper. I take great care to use only archival materials. Photographing the Florida wilderness allows me to experience this wetland wilderness in a very intimate way. My goal is to find those remote areas that have been mostly untouched by man. These wet jungles and swamps are my source of inspiration for the types of images that I make. There is only one Everglades in the world! It is my hope that by sharing the beauty of this fragile region that others will become passionate about this beautiful resource that exists in our own backyard.